is that an actual carrier at 1.720Mhz or just a harmonic of some sort ? i can see the USB IBOC from 1.700Mhz on 1.710 but what is on LSB at 1.710 ? it looks like another IBOC but weaker, that cant be from 1.700Mhz is it ? i thought 1.700Mhz only had one IBOC, last i checked it did. There's an actual carrier of some sort on 1720.011 kHz. It is still there now (1350z) although weaker. No idea if it is from a station of some sort, or just random RFI. I ran another quick waterfall looking at the IBOC signals. I can faintly see the signal on 1710 LSB, it does seem to vary in strength in parallel with the known IBOC signals on 1710 USB and 1690 LSB (you can sort of see it on 1690 USB as well). So I would say it is associated with 1700. 1.710Mhz is hopeless for the northeastern coast of the US thanks to WRCR. maybe night time is slightly better due to WRCR operating at low power but still, it will be a difficult signal (IBOC) to overcome nevertheless for MW pirates. IBOC the devil of MW. Not sure why they even bother still, and we also get hammered by this same station in the midwest. Pros: Many AM radios can pick up 1710, so in theory non hobbyists can listen. Cons: QRM from TIS stations, random Spanish language pirates, and WRCR IBOC. Pretty much unusable in the northeast for DX. Pros: Quiet. Virtually no activity there now. Cons: Cannot be received on general purpose radios owned by the average person. How many non hobbyists listen to above-top-of-the-band AM pirates? My personal feeling is not many, perhaps approaching zero? But others (and I think some operators) say that is not the case, and there are listeners from the general public, or at least they are trying to reach them. In some ways it is like the question as to pirates operating in the "pirate band" (i.e. : 43 meters) vs on random SWBC bands. 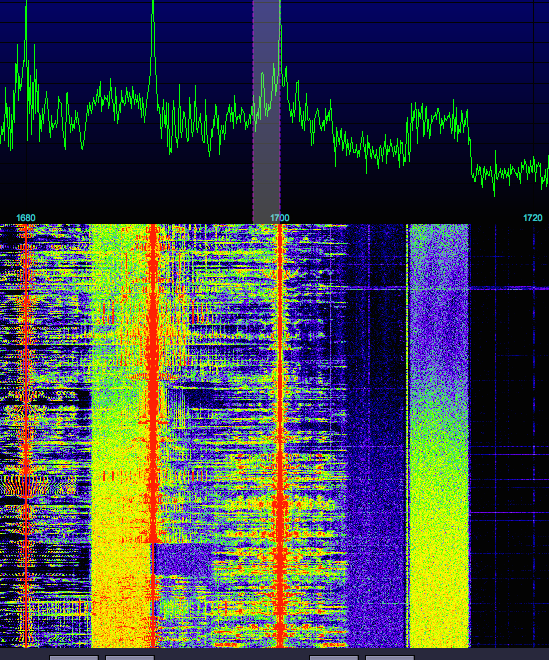 Operating on the former, you get the known audience of pirate listeners, and with the multiple SDRs running, any operation in the 6800-7000 kHz range usually gets noticed right away. But outside the 43m band, transmissions seem to go mostly unnoticed. It was quite a while before we figured out Radio Illuminati was using 6150. I've heard mixed reports from operators regarding their operations outside 43 meters, both some saying that they rarely if ever get any reports, some have said they do get reports. And there's the question as to what percentage of listeners bother contacting the station with a reception report. There could indeed be lots of listeners, but few if any send a report. It would be interesting to hear directly from stations regarding their experiences with out of [pirate] band operations. I could be all wet. I am going to spend a bit more time monitoring the 1700 kHz area, since there seems to be at least some activity on 1710 with that Spanish language pirate. I'm contemplating building some sort of resonant loop antenna for the upper end of MW, for this purpose as well as getting back into DXing TIS stations. Good points, and it boils down to the station OPs feeling on the subject. Example, when the Big Q was regularly broadcasting on 1710, the word got out. How many non-hobbyist actually heard their broadcast is open to conjecture. But I know myself, on good nights I could easily hear this station on my car radio. I know a couple of friends also heard the "Q" on car radios after I informed them of the broadcast. But again, how many actually stumbled across that station or even cared about what they heard is probably few to none. Chris, there is definitely something else there on the upper side of 1710Khz and it cant the IBOC from WRCR, see screenshot. if it was the IBOC from WRCR, wouldnt i see it on the lower side of 1690Khz ? all the other stations that have IBOC have it on the upper and lower sides, not just on one side. I've seen IBOC on both 1710 USB and 1690 LSB, they fade in and out at the same time and along with the WRCR signal, in fact it was there earlier this morning when I checked. I agree that the signal on 1690 is not always there, perhaps they switch it off at times (I don't know all the details about IBOC). i dont see any real purpose to operate in this manner other than to disrupt DX reception at 1710Khz but if their purpose and reason is that 1710khz would carry their IBOC in the clear better than 1690Khz, then so be it. yes one could use LSB SAM with adjustable bandwidth notch filters to avoid the splatter from the USB IBOC and from WRCR but this would be detrimental to the received audio quality in general on 1710khz. despite all this, i still believe there is something else operating at 1710 USB that isnt coming from WRCR at night.